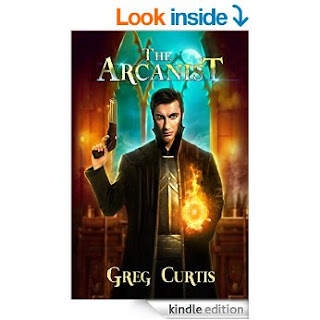 The Arcanist by Greg Curtis. Edouard Severin was useless. Happily useless. The third son of Count Argus Severin he would not inherit the title of count nor the reins of House Barris. He was free to do what he liked with his life provided he didn't embarrass his family. And what he liked was to live in his ancient fort in the town of Breakwater, tinker with his machines and play with his magic. Life was good. Then the city of Theria was attacked by a herd of stampeding mammoths, his older brother Marcus turned up on his doorstep in the middle of the night demanding his help, and he suddenly had to put his skills to use in investigating the crime. Little did he know that the attack was merely the first step in a plan to seize control of the Kingdom of Therion, or that the one responsible would be a member of his own family. Greg Curtis is one of those authors that I don't need to read the blurb to know that it'll be a great book. I've read many of his works and they are all as good as the next one. Admittedly, his writing style is quite elaborate and he does have a tendency to go too in-depth with character's inner monologue and as a result leaves large chunks of texts between dialogue, sometimes, so much so, that I've had to go back several pages just to remember what the last conversation was. The Arcanist is slightly different from his other books in that the main character is not a total recluse who has chosen a life of solitude due to some personal tragedy. Rather, our hero, Edouard, is loved by his family, well nearly all of his family members, and so it was interesting to see a softer, more caring, and less bitter character than Greg Curtis normally writes. Edouard is the third son of a noble family and has accepted that in terms of pecking order, he's at the bottom. He lives a carefree life until that is the city of Theria is attacked by a herd of stampeding mammoths (yes, I did scratch my head a few times at that plot line), and finds himself dragged into the investigation to find the culprits. Edouard is less physically imposing than what I'm used to in Curtis's protagonist's, but what he lacks in brawn, he more than makes up with in wit. He also has a spark of magic which allows him to cast fire. So he's not powerless, but he's not invincible. There are also a host of other characters, main ones being, Marcus, his older brother, who is the warrior of the story, and Kyriel, a handmaiden to an omnipotent magical being. I enjoyed the storyline, despite how predictable it was times. What I enjoy most from Greg Curtis's novels is the personality he installs into his characters, all of his characters have their own little idiosyncrasies, and they become flesh and blood, and not simply words on a page. The world that The Arcnaist is set in is fascinating in that there is a blend of technology, such as cannons, pistols and hot-air-ballons, alongside traditional sword and sorcery. I normally hate reading books that try to marry the two but the concept was well written and didn't feel awkward. Greg Curtis is one of my favourite authors and so it came as no surprise to me that I enjoyed his latest work, so if you haven't read any of his novels, then I not only recommend this book but his other books as well.